My son runs ahead of me, his sweaty toddler feet crammed into his red rubber crocs, lurching and tripping his way across the rock-riddled earth on his way to the greenhouse. He likes to be the first one to grab the hose during our nightly watering routine. My daughter is wrapped around my body, eyes large, following her brother’s movement. We walk past the sweet and heavy lavender, abuzz with round and fuzzy bees and walk through the doors. A humid air envelopes us and we are transported into another world, a small one where bean stalks grow inches by the day, the beds lined with lettuce and swiss chard and spinach and kale and carrots become one big sea of green. The cucumber vines climb up to the heavens, big leaves threatening to overtake us and the sweetpea tendrils looking like something out of the untamed jungle of Jumanji. ‘Everybody is growing up! Peppas, there’s two den! And ‘matoes, pretty pretty cool,’ my son points out to me. He tells me it’s his turn to water, as he blasts the basil and sage with a hard hit. I cringe a little and change the setting to ‘mist’ and allow him to continue on his merry way. He picks a piece of butter leaf lettuce, offering it to me to eat. He asks if the lemons are yellow yet and can he pick them? He runs outside to the strawberry beds, bright brown eyes in search of that juicy red. He spots an indigo blueberry, hanging delicately from the vine and rushes over to tell me. I let him eat it, but he changes his mind and wants me to have it instead. It doesn’t seem that long ago that he and I were out there planting wee seeds, me explaining to him how they needed soil, and sun, and water to grow. Every day we checked, and together we held hands and jumped up and down at the first glimpse of a plant pushing it’s way through the earth, searching for light. I’m still reveling in the miraculous wonder of something so small becoming something so big, and I’m not necessarily referring to the plants. Watching our garden grow, and watching my son grow with it, has made for some magical moments. This is not just a place to grow vegetables. I cherish the things my kids will learn about life and food and chores in this space. I love the enthusiasm and excitement we share over eating something right off the vine, the way he tells his daddy he helped me pick it for dinner, the way he has ownership in this. Sure, I care about the plants surviving, but I care more about my son thriving and enjoying the experience. So if while he’s ‘helping’ he accidentally dumps dirt on top of the new budding cilantro, or pulls out a carrot before it’s ready to eat, or over-waters the celery, that’s okay. Because he’s learning. He’s learning about the life cycles, he’s learning about hard work, and how to care for things, and that food doesn’t instantly appear on a grocery store shelf. Planting fruit, vegetables, and herbs is one of the ways we are making our little farm and garden dreams come true. Last year we moved to a rural piece of property on three wild acres. It’s mostly overgrown with towering trees and undomesticated rhododendrons, but we’re whittling away at the land bit by bit. 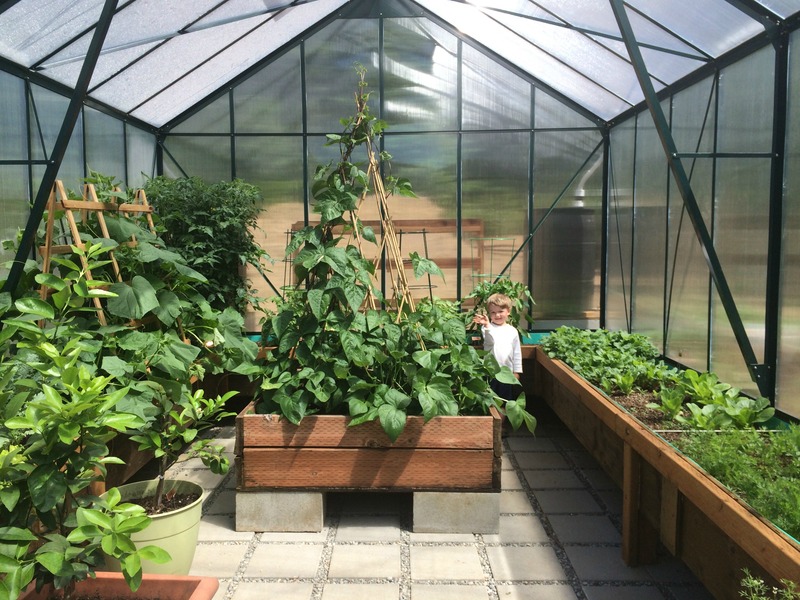 We are fortunate to have so much space, and a brand new greenhouse this year, but even in a small space planting a garden with kids can be doable. The past few years before our greenhouse, we had four garden boxes. That’s it. I’ve always haphazardly planted peas, carrots, a few onions, and strawberries. I never really knew what I was doing and I always hoped for the best, and it usually turned out alright! Last year my son was two-years-old, and I have the best memories of him toddling around the garden beds with no pants on, pulling out sweet carrots, rinsing them off with the hose, and munching them on the cool shade of the porch. The older he gets, the more fun it gets because he understands the process more, but even then he enjoyed eating the fruits of my (very minimal) labor. 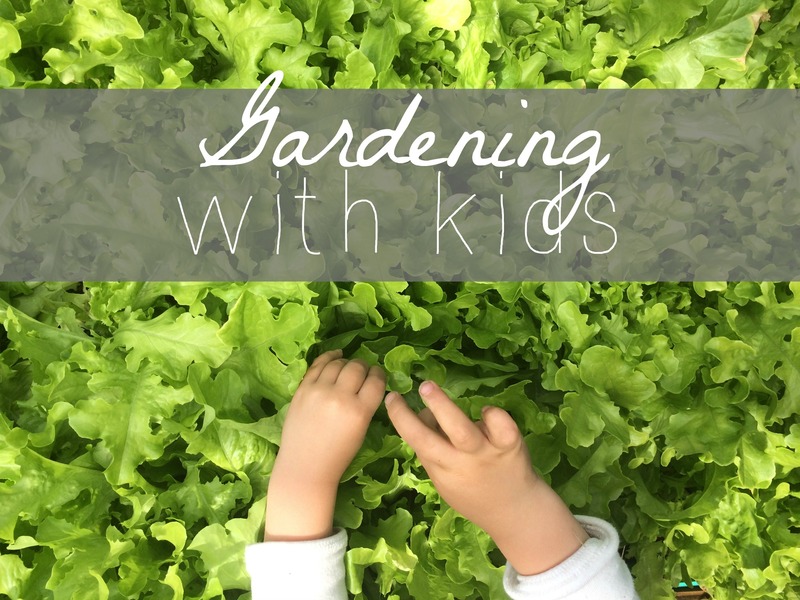 You truly don’t need a ‘green thumb’ to garden a small space with kids. 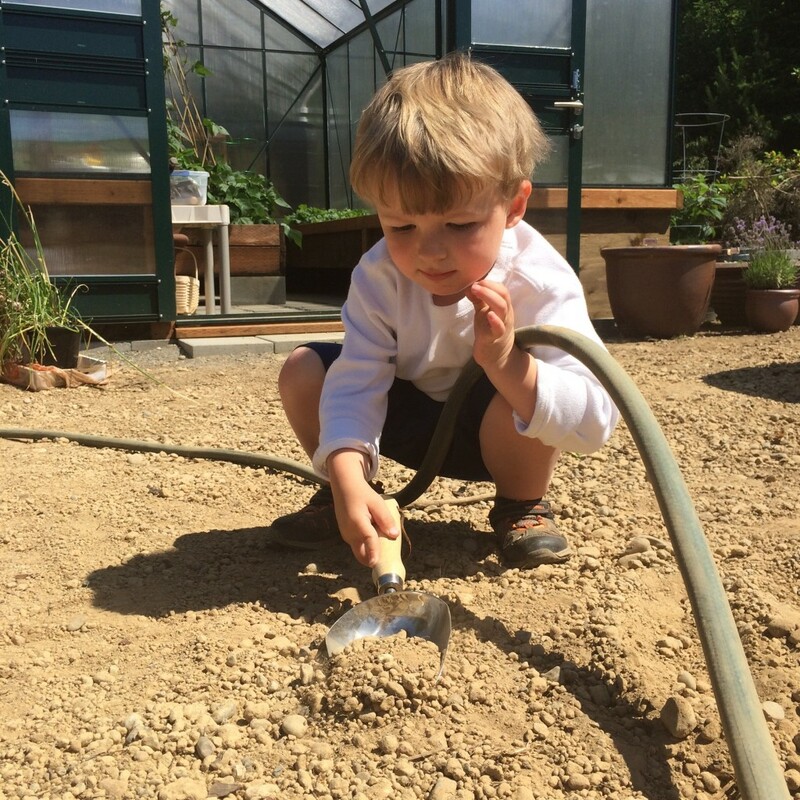 Let your child help choose the seeds, dump in the dirt, water the plants. Talk about what each one will become. You can grow so many things in small pots on the deck if you don’t have the outdoor space! If you aren’t up for urban gardening, you can probably find a community garden plot in your town! 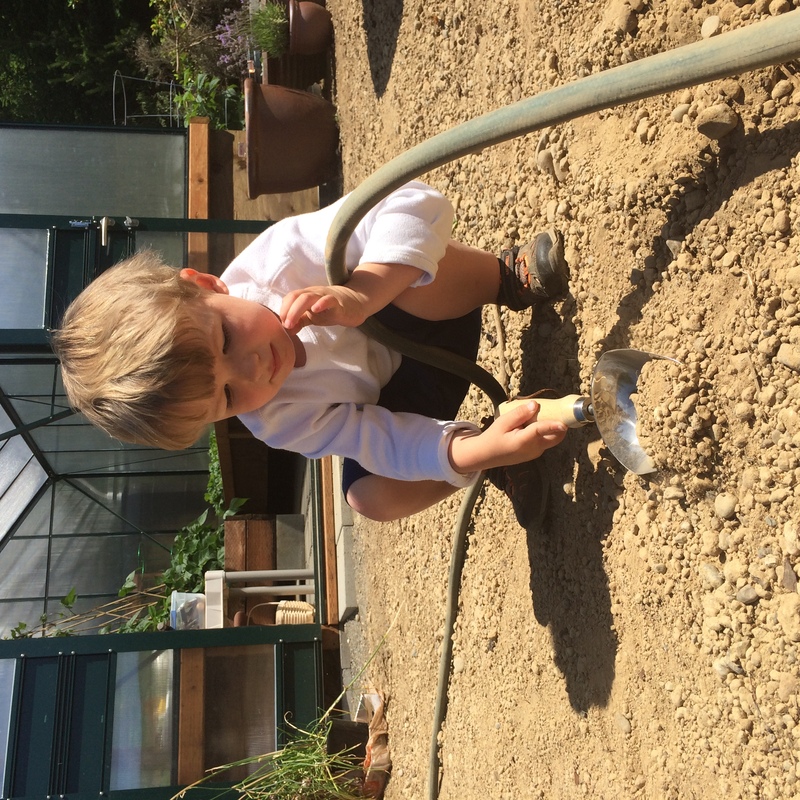 I know my son watches me, and wants to do what I do, so I let him use the small shovels and watering cans. He has his own garden bucket and I let him do as much as safely possible. This is the lifestyle and childhood my husband and I are creating for our kids, and we want them to be all in. How about you? What are some ways you love to garden with your kids? Totally with you. There is a wonder about food, eating and the conscious decision to eat and live a healthier life.